The Japanese words that correspond to the English words, river and creek are "kawa" and "sawa" respectively. "tani" is often used instead of "sawa" when the stream lies in a V-shaped canyon. When they are used to indicate specific streams, the words changed into "gawa", "zawa", and "dani" respectively, e.g. Tamagawa (Tama river), Masuzawa (Masu creek), and Yakushidani (Yakushi creek). Sometimes "mata" is used. This word corresponds to "fork" in English and used like "Higashimata" (higashi means east, and hence, this literally means East fork). There are other local words that mean "river" or "creek". Published by Tsurinotomosha publishing Co. The letters of the title on the book cover and the front page of each chapter were designed by the author. 2. The manuscript by the author is printed with silver ink on the reverse sides of the hard cover. 1 (color photo) Amago of the Nagara river (up). Part of this population smoltify (bottom) in the autumn and go downstream. There are many mysteries in salmonid fishes. Some of the smolts ascend the river as salmon shown in the next page. 2. (color photo) Up: Amago salmon that came back to the Nagara river (photo courtesy of Honjoh Tetsuo, the director of the Fisheries Research Laboratory of Gifu Prefecture). These three pictures tell the relationship among amago and amago salmon (see Chapter 1). Bottom: Iwana of Hokuriku region. 4. Upper left: A mountain stream in the early spring (Inugami river, Shiga prefecture). Upper right: End of snow runoff in headwater (Kuzuryu river). Bottom: Grilled yamame in the hearth of a mountain inn. 5. Upper left: Headwater of Kiso river, Nagano prefecture. Upper right: Headwater of Kitayama river, Nara prefecture. Lower left: Headwater of Ikaho river, Hyogo prefecture. Lower right: Headwater of Ohno prefecture, Oita river. 6. Home of yamame; mountain villages of east and west, established (according to legend) by people of Heike clan, which was driven from power by Genji clan around one thousand years ago. Bottom: A house at Shiibaru, Gokanosho, close to the headwater of Itsuki river, Kyushu. 7. Up: A statue of Buddha at the foot of the mount Daisen (Mitsukue, near headwater of Hino river, Tottori prefecture). Bottom: A mountain stream surrounded by Kitayama Cedar trees (Upper Kamo river, Kyoto). 8. Home of iwana: Houses along a historical road (Yogo village, Shiga prefecture). 9. Up: Mountains of the headwater of Totsugawa (Totsu river) (Yoshino region, Nara prefecture). Lower left: Fishing in early summer (headwater of Ikenogo creek). 10. Up: A collection of large amago. All caught by bamboo rods, with the largest being 45 cm. (at Horiguchi Suikyo's house). Dr. Imanishi is famous in Japan for his unique theory of ecology and evolution. Dr. Honjoh developed the farming techniques of the Japanese indigenous trout species. He first proved that amago is actually the landlocked form of Kawamasu, which is now called Satsukimasu (amago salmon), by releasing amago that was marked by clipping of the adipose fin. This was only after the world war II, and until that time, the regional people had never believed amago and Kawamasu are the same species. Behavior/vision/ mystery of olfaction/function of the lateral line/hierarchy and territory/body temperature and motility. Iwame (pronounced ee-wah-mae) is a variation of amago, in which the characteristic pattern of coloration is lost by genetic mutation. Such fish are found in limited streams in western Japan. Here, I use the word "fly fishing" as the direct, word by word translation from "kebarizuri" meaning the traditional fly fishing style (tenkara) in Japan. There is no description about western style fly fishing in this book. I also add brief summary to some of the contents here, though many of the contents seem to be the same as those in the book you bought previously. 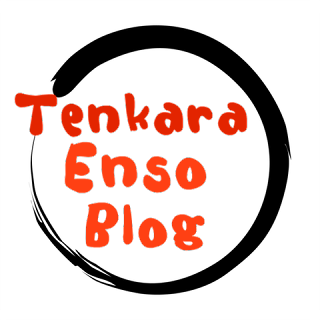 The author discusses the origin of the word "tenkara". You cannot classify tenkara as either dry fly or wet fly fishing. The way of fishing tenkara is much freer than in western fly fishing in which there are rules such as that you should not move the fly intentionally, or that you should not drag the fly etc. Apparently, the author misunderstands western fly fishing. When this book is written very little people enjoyed western fly fishing in Japan. Even when you don't catch a fish, you usually at least see trout responding to a fly. You have to use your brains to make trout to bite your fly. The effort makes tenkara fishing fun and interesting. The author once caught amago that had tried to take his fly 7 times in vain, at its 8th trial. Fishermen sometimes encounter active rises of trout in the evening of the prime season. In those times, a tenkara fisherman often hook amago not only on the water surface but sometimes even in the air when the fly is yet to land on the water. You have to be a magician to amago to make them take your fake bait. It is no wonder that trout take live bait. Making them to take a fake bait is not too easy and you need a certain amount of practicing. However, when you catch your first amago with your hand-tied fly, the difficulty disappears instantly and the door to a completely new world opens in front of you. Fly tying and hooking fish are the two biggest obstacles that beginners often face. When a bait fisherman begins tenkara, he often sees trout respond to his fly, although he usually fails to hook one, which makes him return to bait fishing. The author suggests that a person who wants to master tenkara should quit bait fishing completely and fish only tenkara at least for one full season. 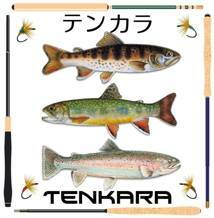 Light, strong and fast action is the required characteristics for a tenkara rod. 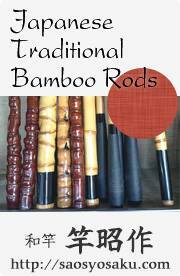 The range of rod length can be 2.8 - 3.6m, although rods of 3.0 - 3.3m are the easiest to handle. Although the author mentions glass rods, which began to appear in the market when this book was written, the rods discussed here are apparently bamboo rods. 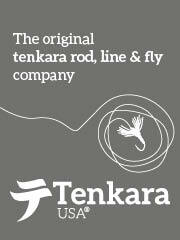 In tenkara fishing, a thick tapered line is used to cast an almost weightless fly. The author discusses three materials to make a line by braiding. The material traditionally used to make tenkara lines. Heavy, easy to cast, elastic, but weak, uneven quality, difficult to braid, and difficult to obtain already at the time when this book was written. Strong, stable quality, easy to braid, easy to obtain, but lacks elasticity, glare is too strong and may spook fish. Many people use nylon for tenkara lines now. Has characteristics that are intermediate of the former two materials. Some people still use this material. Natural silk gut is made by stretching out the silk gland of moth larvae in vinegar. This is transparent, strong, and flexible, and hence an ideal material for fishing lines before the appearance of nylon, though it was extremely expensive and only around 2.5m in maximum length. Artificial silk gut is itself a braided silk filament strengthened by resin and other chemicals. This is much cheaper than the true silk gut, but easy to be degraded, transparency is low, and it floats on the water. It is almost impossible to obtain this material now. Nylon monofilament should be used. Standard thickness is #1.5 (about 0.2 mm = 0.008 in.). The length of tippet should be at least 1 m (3.3 ft.). The author recommends 1.6 - 1.7 m.
The author explains how to braid nylon monofilament to make a tapered line for tenkara. As described previously, amago catches anything that look like bait and if they are not eatable, amago expel them within a split second. So, a tenkara fisherman has to set hook with a lightning speed at the moment when fish takes his fly. Here, I (the author) would like you to know the structure and idea of a tenkara fly before tying one by yourself. The author repeatedly emphasizes that the time period during which amago is holding a fly in its mouth is very short and that a fly is expelled in the twinkling of an eye. As you are well aware, this is wrong. amago, just like other trout, often hold a fly well over one second, if the fly is presented naturally and the fish is not spooked. There are numerous kinds of fly patterns in the western fly fishing or in the fly fishing for ayu (smelt-like fish that is very praised as both a game fish and a delicacy in Japan). However, the patterns for tenkara flies are very limited, and the flies that had been traditionally used by professional fishermen do not necessarily look very neat. On the contrary, they usually look crude and shabby. Still, they can easily catch trout with such a fly. The important thing is not the look of a fly but how to use it in a stream. In other words, a tenkara fly exert its effects in its movement. There are two types of flies; imitation flies and fancy flies. However, you cannot imitate all the aquatic insects and their different developmental stages. Instead, you can tie and use fancy flies and, surprisingly, a fancy fly usually catches more fish than an imitation fly. Fig. 21A is drawn with just a few lines and a dot, yet you will notice a woman's body. Fig. 21B is just a thick winding line, but you can see a snake here. If its shape, size and movement are right, amago will catch a fancy fly. Thus, a fly doesn't have to be a copy of a real insect. Rather, a simple and impressive fly is more effective to fish. An adult aquatic insect has two major parts in its body; the wings and abdomen. Dr. Sugimoto says trout can see only the vein of wings of an insect that is floating on the water surface, because the other part of the wing is transparent. Hackle can represent wings and legs of an insect. Wings or tails may make a fly look cool, but they don't necessarily increase the insect-like impression of the fly to fish. On the contrary, they might cause difficulty for fish to gulp the fly. Some books say a fisherman should use a fly with appropriate color for each season and situation. However, the author has used a same fly throughout the season, throughout Japan, without problem to catch iwana, yamame, or amago. The author only uses flies with pale yellow body and nothing else recently. The author believes the most important factor of a fly is its shape. Secondary, the size, and the color comes third. (2) Materials and tools .................................................................................244. Here, the author explains how to tie a fly. Because fly tying vice had not been widely introduced into Japan, the author uses a needle holder to hold the hook. I don't think it is necessary to explain the way the author tie a fly without a tying vice. Instead, the author points out one clue; the hackle should not be too thick. If you think the hackle is too thin, it is usually just right. Success of tenkara fishing thoroughly depends on the fisherman's skill, which includes fly tying, preparation of the rig, selection of water, casting, rod control, and stream walking. Because the casting mechanism in tenkara is principally the same as in western fly fishing (right? ), I don't think it is necessary to explain this section, except for one part, where the author explains, "If you just flip the wrist forward at the final cast, the rod tip will bounce back, which will flip up the fly again. To avoid this, you have to further straighten your wrist at the end of the final cast so that the fly quietly land on the water surface." You have to practice to cast a fly to the exact place you intend. The accurate casting is needed not only to land the fly on the desired spot but also to follow the fly by your eyes. If you don't know where your fly has landed, it is very difficult to find it. If you know where your fly is, you know when fish takes it by the reflection of light by fish body, even if you cannot see the fly itself. When you become to be able to cast straight to a desired spot, you should learn side throw or some trick casts without back cast in order to avoid obstacles such as overhanging trees. Instead of straight back cast, you can turn the line in “S” or “8” shape over your head and cast forward so that you can avoid snagging trees behind you. When fish are very active, they readily take a fly just by drifting it naturally. However, you can prompt trout to take a fly by adding a life-like movement to it. The relatively easy and effective way is to pull up the rod tip slightly rhythmically. The movement of the fly in this way within a stroke should be less than 2 inches. Don't continue this movement too long in the same spot. Rather, make another cast and do it again. There are 4 different ways of drifting a fly. A. Cross cast and down swing. B. Upstream straight cast and natural drift. C. Sharpshooting a small spot. D. Twitching retrieves. Make each strip very small. Set the hook sideways to avoid pulling the fly out of fish mouth. From the author’s experience, hooking seems easier when the fly is 2-3cm (1 in) underwater rather than when the fly is on the water surface. B. Position of a fly: See Fig. 24. C. Water depth and the cone of trout vision: As you can see from the Fig. 25, a fish staying in deep water can see a wide area of the water surface, whereas a fish in a shallow can see only a narrow area of the surface. See explanations of Figs. 26 and 27. If you cast and control your fly properly, amago rise to the fly when the condition is right. The last issue to master tenkara is how many fish you can hook among amago that rise to your fly. The reason for the failure of hooking is usually that your reaction is too late. You must set hook at the instance when you see the body of amago, or the light reflection by the fish body. Amago is very quick. I (the author) can never emphasize it too much. Unlike hatchery-reared rainbow trout, amago or yamame never try to return to deeper water with a fly in their mouths. I believe amago spit out the fly it takes within a split second. When a veteran bait fisher tries tenkara, he is often frustrated by the fact that he often fails to set hook though he sees amago rise to the fly. As a result, he tends to return to bait fishing, in which he has confidence. Therefore, if you are a bait fisher and want to learn tenkara, you have to be really determined that you don't take your bait fishing gear for a while. In this book, the author often emphasizes the quickness of amago when it catches a fly and spit it. However, amago, as well as other trout species, hold a fly in its mouth for more than a second, when the fly is drifted naturally. I think this discrepancy is probably caused by the tension of the tippet. I have little experience of tenkara, but I guess the line and tippet seem always rather tight in tenkara, thus, when amago take the fly, the fish feels its tension, which makes the fish release the fly from its mouth instantly. On the other hand, in fly fishing, dry fly fining in particular, there is usually much slack in tippet and line so that a trout doesn't feel any tension when it takes a fly. 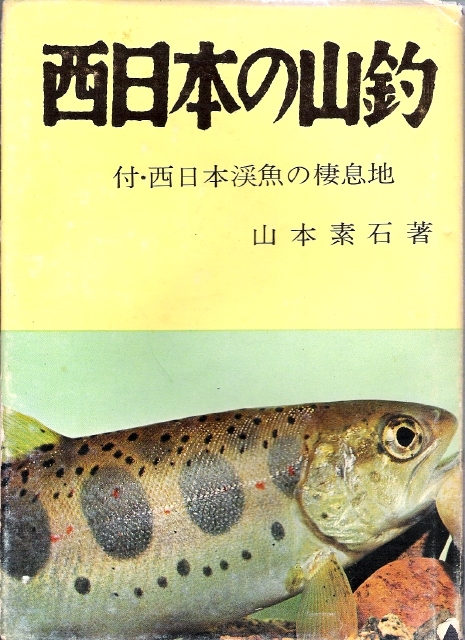 Author's mentor, Dr. Sugimoto, told him to forget about bait fishing for one season if the author wants to learn tenkara. Here again, the author emphasizes the importance of the timing of setting hook. When you set hook, try only to use your wrist, but not the elbow or shoulder. If you use your elbow or shoulder, your movement tends to become too late and too strong, which sometimes causes tippet break. To set hook, a fisherman have to watch the fly. However, he should not concentrate on the fly. He should rather look at a larger area surrounding the fly so that he doesn't miss the movement of fish that rises to the fly. In a stream, there is a place or a certain flow where trout come to take food. A good fisherman knows where fish take their food when he looks at the stream. This depends on the condition. The author once caught amago at the 8th rise of the fish to the fly. Of course, when an amago touches the fly, the fish never rises. In my experience, amago usually doesn't rise to the same dry fly again when it fails to take it, even if the fish doesn't seem to touch the fly. In this season, I have gone fishing for three days, and only one fish rose twice to my fly (I caught it on the second chance). When you come to a new river and don't know what kind of fly you should use, the author suggests a fly with the body of pale cream color. Tenkara flies are very simple and you don't have many choices for the fly shape. When fish don't take your fly, the possible reasons are; (1) Your fly control is not good, (2) Your fly is too poor, (3) Trout don't like the color of your fly, or (4) The fly is good but trout somehow don't like it. However, the author believes the fly color is not an important issue, from his experiences. He believes the order of importance for the characteristics of a fly is (1) shape, (2) size, and (3) color. If the color is not very important, a fisherman should use a fly with a body color which is easy to see. In summer, amago is very difficult to catch. Let's go to mountain streams to catch iwana with tenkara. A fisherman can use the same flies as he uses for amago. In streams where large iwana live, larger flies are better, in order not to hook iwana securely. The author does not mention this, but iwana sometimes apparently prefer large flies. You can use the same rod and rig which you use for amago. In summer of western Japan, however, you may have to go into very small headwater streams to fish iwana, where you cannot "cast" the fly. In such a very small stream, dapping is a very effective method. You can connect a fly with a 6 foot, 2X monofilament directly to the rod tip. In this fishing, downstream fishing is easier. You just gently put the fly on the water and let the fly be drifted by the water naturally. You may either see the fish rise, or feel fish take directly by your hand. Iwana is slower than amago. A tenkara fisherman who has struggled with amago, may fail to hook iwana because his hooking action is too fast. Be sure to set hook after the fish take the fly. Iwana may rose to the same fly twice or three times. This is true. I have an experience with an iwana which rose to my fly 4 times in vain. I then took off the tail from the fly, and at the 5th trial, the fish took the fly successfully, and I caught the fish successfully. This chapter is co-authored with Sugiura Reiji, the head of Tokai chapter of Japan lure fishing association. Here, the fishing in which hard lures or spinners are cast by a rod and reel (spin fishing or thread lining) is explained. In early season, when the water temperature is low and amago don't come to the surface, you can sink flies deep to catch fish. In order to sink a fly, either 4X or 5X nylon monofilament should be used instead of the usual tapered line. You may use a bait rod. You can also add a dropper fly or an indicator for bait fishing. Cast or put the fly into small waterfall so that the fly goes deep into water. Then, gradually bring up the fly with small twitching actions (See Fig. 41.). You directly feel a strike by your hand. The size of flies: I cannot summarize this section, because the author does not say any conclusive comments. Well, in summary, he says he doesn't know about it. Hackle length: The author says only one thing. When the hackle is hard and strong, it should not be too long, because long, hard hackle can be an obstacle for fish to take the fly. Storage and smell of flies: You should store flies with camphor to keep bugs away from flies or to prevent flies from decomposing. Furthermore, fish like the smell of camphor as Izaak Walton wrote in "The Complete Angler." Is this true??? Regional differences in flies: There are various local flies in Japan (See the Fig. 42). 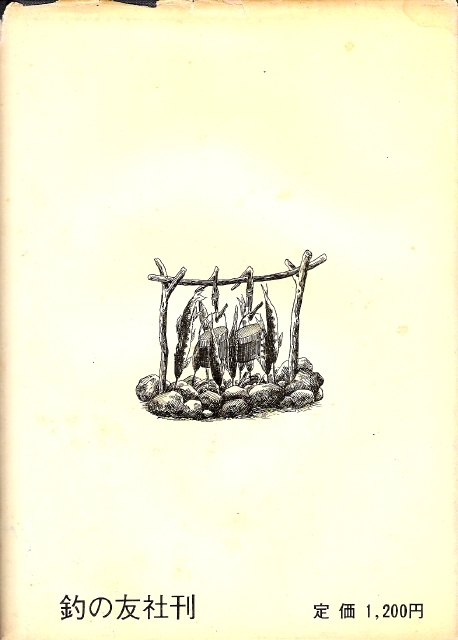 In this book, the author has shown how to tie the fly that has been used in Kiso region. The fly is very simple. Any unnecessary parts are omitted in this type of fly. You cannot further simplify this fly. The author has been used this fly throughout Japan, and the fly always caught trout. It seems that a fast-action rod results in tippet breaking at hooking more often than a slow-action rod. However, the truth is on the contrary; tippet breaks more often with slower rods. This may be because the amplitude of vibration of a slow rod is greater than that of a fast rod. A fisherman must know how to handle his rod effectively and master the fast, but soft hooking. If trout never take your fly, stop fishing. However, the author is very insistent and wants to catch fish somehow. Sometimes, techniques are needed to entice inactive fish. (a) Casting a fly to a targeted spot for a few times. Don't let the fly stay on the water. Instead, pick up the fly immediately when it touches the water. In other words, hit the water surface lightly with a fly for a few times. Then, cast the fly as usual to catch fish. It is important to take a short interval of time before the final cast. (b) Move the fly just above the water surface to show the vague, insect-like image of the fly to fish. Don't let the fly touch the water. When you see a fish move, drop the fly on the water immediately. Sometimes you catch fish in the air. You can perform this technique more easily with a dapping rig. (c) You may just repeat cast and pickup in a certain rhythm, though this is not a very skillful method and the author doesn't recommend this. Also, there is a way in which a bare hook is trailed under a fly, so that the fish that don't take the fly may be snagged. This is a "dirty" method, almost giving up catching fish with tenkara. The author introduces this method just in case for the occasion when you need to bring fish home at any cost. As time goes on after the opening day, trout come to be intimidated by a fishing hook and become spooky. If you can catch such trout, you are already a full-fledged tenkara fisherman. Approach is very important. When a fisherman once gets used to tenkara, he often become rather careless about approach. You always have to be very careful not to spook trout when you try to come close to fish. The technique of stalking fish can make a great difference in the catch. If possible, a fisherman should fish with the sun on his back, so that he would not be bothered by the reflection of sun light by the water surface and see the fly well. A good fisherman can know if there is someone ahead of you in a stream by a trace of the person such as foot prints. If there is another fisherman, give him enough space and time. You may go some other stream. If you meet another fisherman, say hello to him and share the stream with him. Nowadays, a famous river can be very crowded by trout fishermen, especially on the opening day. If there are too many people in a stream, fish are spooked and difficult to catch. In such a time, just keep your pace and never rush. Don't join the race of other fishermen. Broil with salt/marinade/steam with kudzu leaves/sashimi/fry/sauté with butter/broil with miso/soup/salted gut/grill on a baked stone/boil. Photos are numbered consecutively up to the Chapter 6. There are no numbers for the photos after the Chapter 7. Line drawings are also consecutively numbered throughout this book. There are only 2 tables in this book. 5: Top, amago; Bottom, yamame. 6: Schooling amago larvae, still carrying lunch boxes from their mom on their belly. 7: Both are amago but look very different from each other. Top, 27cm. Bottom, 19cm. 8: Skin of amago around the gill cover. Note the parr marks are under the scales. 9 and 10: Amago smolt. Top, from Ibi river. Bottom, from Nagara river. 19-22cm in length. 11: Amago and smolts from upper Ibi river. 12: Yamame smolts caught at the inlet of Ogamigo river into Mihoro lake. Top, 27.5 cm, growing to masu salmon. Bottom, 21.5 cm. 13: Male masu salmon which migrated up to Mumaya river 3 years after the completion (1961) of Mihoro dam. 14: Biwamasu (at Samegai trout hatchery, Shiga prefecture). Biwamasu is a closely related trout to amago. It's also a type or subspecies of Oncorhynchus masou. This fish is unique to lake Biwa and rivers flowing into the lake. Biwamasu is genetically isolated from amago living in the same place. 15: Kawamasu (Sea-run form of amago, which is also called Satsukimasu) that have come upstream to Nagara river. You can see the changes from amago in these fish. (photo courtesy of Honjoh Tetsuo, the director of Gifu Prefectural Fisheries Research Station). 16: The face of amago. Funny and at the same time, fierce. 17: Anterior part of the body of amago. This individual has black spots on the belly. 21 and 22: Gogi. Note the white spots on the head. Bottom, a younger individual. "Gogi" is the local name of iwana in Chugoku district. The pattern of white spots of the fish is said to be slightly different from iwana of other regions. 23: The face of yamame. Around the eye, there are black spots which iwana do not have. 24: The face of iwana, exhibiting deeper lower jaw compared to yamame or amago, while the body height is lower. 25: Amago (bottom) and iwana (top). Iwana looks paler, because of the reflection of light in this picture, but iwana is actually much darker in body color than amago. 28: Amago just after hatching. Total length of the body is around 2 cm. 29: Removing dead fish from hatched larvae. 30: Amago at 1 year after the hatch. The fish is under the process of smoltification. 31: Stocking of juvenile amago into a river by a volunteer group. Fish are transported by a car in a plastic bag filled with water and oxygen. 32: Sunset of Ibarakawa, the abandoned village located in the deepest of Suzuka range. 33: Ghostly, abandoned houses. These houses have been broken and disappeared now. The roofs of these houses were made of silver grass, which you can see in the foreground of the picture. This type of houses is only seen in limited sightseeing destinations in Japan now. "Huchi" or "-buchi" means a pool in Japanese. 38: An example of a flat stream. 39: An example of succeeding small waterfalls. 41: A pool under a small waterfall. 42: A pool to which water is flowing into fast. 43: A pool at a confluence. 44: A riffle with rough surface. Japanese streams are fragmented by these small dams, which are made officially to prevent eroded soil or sand from being washed downstream. However, these small dams are quickly filled with sand. Actually, dams (including big ones) are often constructed to give jobs to local people, or to stimulate local economy. 48: Various creels. The right two are made to transfer fish alive. 49: Various bait boxes. Upper left, 2 plastic boxes; for terrestrial bugs. Bottom left, metal boxes that can be tightly shielded. Right 3; wooden boxes (for aquatic insects or ground worms etc.). 51: Preparing the rig by the steam you fish. Don' hurry. 52: A place where trout are found throughout the season. The water is deep, the bottom is irregular, and the flow speed is appropriate. 53: Another place where trout are found throughout the season. Wide, fast flow is running into this pool, and relatively deep water is long tailing. 54: A place you should fish in the prime season. There are some different lines of fast water. The rocks on the bottom are large. 55: Another you should fish in the season. The spots around the white waters are very good targets. 56: Fish often feed in both sides of the white water in spring and at the end of the pool in the prime season. 57: A fisherman, heading toward headwater through a bushy mountain trail. 69: (g) Left, the tip of a peacock tail feather. Top, pheasant. Middle, sparrow. Bottom, Plymouth Rock. 70: (h) This is a line drawing as you see. I'm sure you can tell what the author is trying to explain with this figure. 79: How to hold a rod. A; You can flick the wrist easily. B; The wrist movement is rather restricted. C; quick hooking motion is often difficult. D; the wrist tends to be twisted and tired. Thus, A is recommended, although when you get tired, you may temporarily change the grip into a different way. 80: The contents of the author's fishing bag. 8; Two pairs of small scissors. 81: Difference between individual specimens of iwana. Top; Kinoegawa (Kinoe river), Tottori prefecture. Bottom; Mannamigawa (Mannami river), Gifu prefecture. 83: Lure fishing rods with offset handles. 92: Amago salmon caught on a lure. 1: (p. 36) Scale reading. (Left) A scale of amago less than one year after hatching. No winter band is seen. (Right) A scale of 3-year-old amago. There are two winter bands indicated by circles. 2: (p. 92) Names of body parts of amago. I'm sure you know the English name of each part. Explanations of the symbols used in the Japanese topo map (either 1/50000 or 1/25000), which is made by Geospatial Information Authority of Japan. I did not translate further explanation written in the bottom of the figure. (1) Water fall; Two dots indicate the downstream direction. (2) Small dam to prevent the soil from being washed downstream; These are actually not usually indicated in a map. (3) Large dam; The figure under the line indicates the depth of water and the figure inserted in the line indicates the altitude of the water surface. The figures are in meters. (4) Rocky cliffs on both sides of the stream. (6) Stream in dry river bed with large stones or rocks. (7) Dry river bed with subterranean stream. (11) A lake made by a dam. The way to know directions using a watch and the sun: Hold the watch horizontally, attach a small bar like a match onto the center of the watch vertically so that the shadow of the match overlaps the short hand of the watch. The line that divide the angle made by the long and short hand of the watch into 2 halves is the direction of north. If you place the shadow of the match in the middle of the two hands of the watch, the long watch hand indicates north. Loose estimation of the distance on a topo map (1/50000) with your fingers: If you fully spread your forefinger and middle finger, the distance between both fingertips will be about 4 km (8cm). If you spread your thumb and forefinger, the distance between both fingertips will be about 8 km (16cm). If you spread your thumb and little finger, the distance between both fingertips will be about 10 km (20cm). Apparently, these cannot apply to most westerners, who have much bigger hands. Right: How to wear waraji. If the strings are too long, roll them around the ankle. The knot should not be too tight. If the waraji becomes out of the position while walking, exchange left and right waraji as soon as possible. Left: When you have to step on a stone that can be moved, step right on top of the stone with the entire sole (top). It is dangerous to step like the bottom illustration. The thick arrows indicate the direction of the force. 6: (p134)Branching patterns of mountain streams. Top left: Branches run perpendicularly to the main stem of the river; Streams of this type are often surrounded by steep canyons, and moving along these streams is usually difficult. Top right: Tree-shaped type, which is most often seen. Middle left: Branches are separated by thin mountain ridges and run parallel to each other. 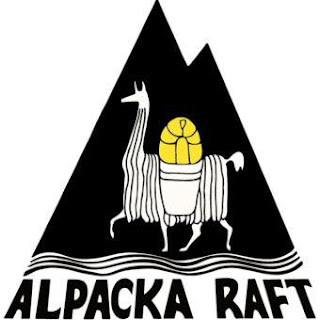 Middle right: Streams are radiated from a lone peak. Bottom left: Ring-shaped type; Akatani of headwater of Ibigawa (Ibi river) runs along the foot of a mountain and is a typical example for this type. Bottom right: Fan-shaped branches; Streams of this type is usually flat. Right, wooden hook. Middle, hook made of animal bone. Both are excavated archaeological finds. Right, a modern fishing hook. The illustrations are from "The Tale of Fishing Hooks" by Dr.Naora Nobuo. Designation of a 5 piece rod. Hosaki; the tip section (The line connecter and male ferule are indicated) / Homochi, meaning "tip supporter". the second piece. / Nakatsugi, meaning "intermediate piece". the third piece. / Nibante, meaning "the second piece." the forth piece from the tip. / Temoto, meaning "hand section." the but section. The female ferule is indicated. 9: (p157)Typical examples of the bait fishing rigs for trout in mountain streams. Left: For very small streams. The rod length should be 3.5 m or less (You can use a fly fishing rod (tenkara rod)). The total length of the line and tippet should be less than 1/3 of the rod length. A small split shot and no indicator. Middle: For branch creeks. The rod length should be 4.5 m or less. The total length of the line and tippet should be shorter than the rod length and can vary according to stream conditions. Right: For relatively large streams: The rod of 4.5 - 5.4 m is often used. The total length of the line and tippet is the same as that of the rod. Usually an additional indicator is put 60cm above the indicator. The position of the lower indicator should be changed according to the situations. Inset: How to connect the tippet to the line. Loop to loop connection is shown here. Indicators for mountain fishing is used to indicate the position of the line (hence, the position of the bait). They are not floating indicators, and attached onto the position above the water surface. The indicator tells the bite of fish to the fisherman by its movement. An experienced fisherman can tell a strike by a subtle slack in the line. By the way, It is said that a master fisherman can set hook without any indication of the bite because he knows exactly where a fish take the bait. Top left: Pine-leave connection. The upper illustration indicates the two loops made at the upper end of the line. The lower illustration shows how to connect the line to the rod tip. There is usually a small piece of string with a knot on the rod tip. The line is connected to the rod tip by pulling the line to the direction of the arrow. The line can be taken off by pulling the small loop. Top right: Various types of hooks for trout fishing: top left, yajima type; top right, kitsune type; middle left, izu type; middle right, nagara type; bottom left, sode type; bottom right, iruma type. Bottom: Various knots used for line connections. For every knot, pull tight and trim the tag ends as shown in a-(2). 11: (p160) Connections of tippet and hook. As you see, bait fishing hooks for trout do not have an eye. 12: (p163) Top: Various indicators and weights. The positions of indicators can be flexibly changed. The weights are all split shots of different sizes except for the one in the illustration of the second from left, which is a rolled piece of lead sheet as explained in the bottom right of this page. The indicators are (from left to right); very thin vinyl tube (in bright different colors), wool yarn (white or pink), stripped peacock feather stalk (partly colored by ink), arrow feather-shaped celluloid (should be made small), bird feather the bottom of which is wrapped with string. Bottom left: How to make a traditional indicator from a branch of a plant called "yamabuki". I do not translate the explanation. Bottom right: How to use commercial sheet weight of lead. 13: (p169) How to fix bait to the hook. Note the hook point is always exposed. Top right; how to fix the ground worm to the hook. The usage of a tool to put the hook and tippet through a ground worm is explained. This thin, wire-like tool has a small hole on top to fix the hook point. First, you put the tool through the entire body of the worm. then fix the hook point on top of the tool and squeeze and draw the worm through the hook to the tippet. Moth larva (you can put the worm either head first or bottom first), salmon eggs (if big, one egg is enough), large caddis larva (you may put the hook through its dorsal side), stonefly or mayfly nymph (you can put the larva in upside down), sewing of a ground worm with the hook. Spider (if too big, remove legs), butterfly (if too big, tear part of wings away), mayfly nymphs (like copulating or you can make them kissing), You can adjust the number of nymphs according to their size. Now, you can see this species is first described by Dr. Imanishi who appeared on a picture in front pages of this book. Top middle; Larva of Epeorus mayflies. Top right: Larva of Cinygumula mayflies. Bottom: Mayfly nymphs clinging to a stone in a stream. Top left: Stonefly adult. Top right: Stonefly nymph and its characteristic claws. Middle left: Caddis nymph of family Hydropsychidae. Middle right: Caddis nymph (Stenopsyche marmorata). Bottom: Different types of the cases of caddis flies. How to cast a bait rig. Arrows with wavy lines indicate the direction of the stream current. A: The direction of the rod swing. B: The direction of the line movement. 17: (p226) How to make a braided tapered line. Revolve the monofilaments while strongly twisting the monofilaments with the thumb and forefinger of both hands. In these illustrations, braided texture of a line is omitted and a line, which is actually braided is drawn like a simple monofilament to make the explanations understandable for readers. Left top: Making a loop at the rod end of the line. Hold “B”s and pull “A” tight. Left middle: Making a loop at the tippet end of the line similarly as above. Trim the tag end. Left bottom: Add double loop of braided nylon or silk thread to the rod end of the line as shown here. Right column: Thee connection of two braided lines. Hold the two ends together and make a loop. Then place A and B through the loop twice together. Pull tight, trim tag ends and apply glue to the knot. Top left: Hand-made spool for holding a rig. Hang the hook in the smaller hole so that the hackle is placed in the larger hole at the center of the spool. Wrap the line around the spool by placing the tippet through the slit A. Insert the end of the line to either of the three remaining slits; B, C, or D.
Right: An example of tenkara rig. Line (combinations of braided lines of artificial silk gut,); Six #4 lines + 5 #4 lines + 4 #4 lines + 4 #3 lines + 3 #3 lines + 2 #3 lines + nylon tippet #1.5. Length is not indicated. Bottom middle: A rig for very small streams. Although the illustration is small, the rod for larger streams can also be used. The line is not necessarily made of braided lines. The combination of nylon monofilament, such as #5 + #3 + #2 or only #2 line will do. The line numbers indicate thickness of the line, which slightly differ among different line producers. Contemporary #1 line nearly equals 4 x. However, #4 line at the time when this book was written, was much weaker. 20: (p231) A: Customizing the rod tip. (2) Shave the rod tip. Make a knot at the end of a short piece of braided silk line. Unravel the other end of the line, and cover the shaved rod tip with the unraveled line. Wrap it carefully with a silk thread and fix it with glue or urushi, which is lacquer taken from a poisonous sumac tree. B: Connection of the rod tip and line. The illustrations show how to connect the double loop attached to the end of the line to the braided silk with a knot. You can tighten the connection by pulling the bottom loop and can loosen it by pulling the smaller top loop. C: Loop to loop connection of the line (braided line of #2 or #3 artificial silk gut) and tippet. (#1.5 nylon monofilament). Glue should be applied to the knot of the loop. D: Connection of a fly and the tippet. Put the tippet end through the hook eye. Make a loop on the tippet end. Let the fly go through the loop and pull tight. Trim the tag end of the tippet. E: Another way of the tippet/fly connection. (6) shows a different way of putting the tippet through the hook eye. Otherwise, the connection can be similarly done. In the text, the author explains abstraction in fly tying using the middle and left illustrations. He says you can recognize a woman's body by a few simple lines in the middle without a face or other parts of the body. Also you can recognize a snake in the left illustration. Thus, you don't have to precisely imitate the insect body when you tie a fly. You present something that implies an insect to trout. The author shows an illustration of an adult mayfly (top), an imitation fly (middle, It is the author who says this is an imitation, not me. ), and a fancy fly (bottom) in the right column. (1) Back cast: Swing up the rod. The line is extended backwards. (2) Forward cast: Bring down the rod. The line comes down in front of the fisherman. Y and Z show good and bad presentations, respectively. 23: (p263) These illustrations explain the pulling or loosening of the line and the hackle movement. 24: (p266) The drawings show the relative position of the fly to fish. A. The position that is easy for fish to take. B. The position that is rather difficult for fish to take. C. The position in which the fish often fail to take the fly. 25: (p266) The water depth and the sight of fish. The illustration indicates that fish can see wider area of water surface when it is positioned deeper water. 26: (p272) Various rise forms. A. Trout rises with a splash simultaneously when the fly touches on the water. Hooking tends to be too late for this type of rise. B. Fish rises straight to the fly without a splash. Easy to set hook. C. Fish jumps to the fly vertically and fell down to water from tail. This type of rise is made by small fish in shallow water. D. Fish rises vertically and turn sharp to the water. Always decent fish. E. Fish catches the fly quickly from side and turn sharp. Easy to set hook. F. You can see trout chasing the fly. Be careful not to set hook too fast. G. Trout slowly comes from a deep pool. Don't try to set hook too fast. H. When you drift the fly underwater, you should set hook when you see a flush in the water, because it's a rise of fish. I. Fish jumps up to the air to the fly showing the whole body and return to the water from the head. The size of fish is often medium to large. J. Fish beats the fly by the tail. The fish may take the fly if you cast to the same place immediately. K. Fish chases the fly but rejects it. L. You can see fish flashes in the deep water but the fish don't come up to the fly. 28: (p280) The casting and hooking postures. (a) At the end of casting. 29: (p298) An example of feeding behavior of iwana. (1) Iwana finds food. The arrow indicates the direction of current. (2) Fish chases the food. (3) Fish turns and take the food, and the tippet tention is loosened. The indicator often stops or moves against the current. (4) Fish tries to return to the previous position. The indicator is dragged against the current. 30: (p304) Presentations of the fly. In (1), the fish A can see the fly but B cannot. In (2), the fly is well under the water surface and both fish can see the fly. Figures from #31 to #40 explain fishing with hard lures, which was not very popular in Japan when the book is written. I omit translations for most of those figures. 31: (p313) Explanations of lure fishing rigs. 32: (p329) Swimming course of a retrieved lure. (A) is more desirable than (B). 33: (p332) Figs. 33 -39 explain the courses of casting and retrievals of lures in various situations. 41: (p366) Fishing with a sinking fly. 42: (p373) Flies of different regions. 43: (p389) Top, measurement of various body parts of trout. Bottom, the figure called NTC, which is the length of the hypotenuse calculated when you assign body weight (g) and total length (cm) to the legs of a right triangle. This is the invention of the author to show the fish size which represents both body weight and length. NTC is for Notarin Club, which was a fishing club the author belonged to. (“notarin” means stupid or crazy) When the lower leg is the total length, sine alpha apparently shows the fatness of the fish. I have never seen anyone using this NTC. Table 1 (p319) Combinations of rods and reels for lure fishing. Table 2 (p346 & 347) Various hard lures and fish species actually caught on those lures.